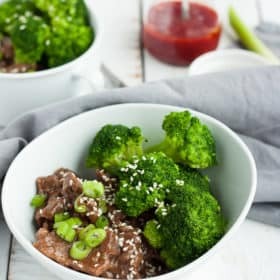 A healthy takeout copy cat, Instant Pot Beef and Broccoli is a perfect weeknight meal. This delicious dish is Whole30 compliant, paleo, and gluten-free. Toss your thinly sliced beef (see how to notes above) in 2 tsp of baking soda. Set aside for 10-15 minutes while you prep the rest of your ingredients. Combine your pineapple (sustainable/pro tip: if you are using fresh pineapple, use the core for this recipe), sesame oil, coconut aminos, rice vinegar, garlic, and ginger in a food processor or blender. Process until mostly smooth. (See recipe notes if you don't have a food processor or blender). Rinse your beef and pat dry with paper towels. Add the pineapple blend to the bottom of the Instant Pot and add the beef on top. Stir to make sure all the beef is coated with the sauce. Lock the lid into place and set the steam release handle (valve on top) to “Sealing”. Press Manual>High Pressure>8 minutes. When the Instant Pot is done cooking, allow for a natural release for 10 minutes, and then use a clean kitchen towel and flip the steam release handle to “venting” to remove any additional pressure. Combine arrowroot powder and cold water in a separate bowl and mix thoroughly. Press "Keep Warm/Off" button and then "Saute". Add the arrowroot mixture and stir to incorporate it into the beef mixture. Cook down on Saute for 1 minute. Add the frozen broccoli to one side of the Instant Pot. Put the lid back on and set the steam release handle to "Sealing". Press Manual>Adjust>Low pressure>0 minutes. Pro tip: zero pressure means the broccoli is actually getting perfectly cooked while the Instant Pot brings it up to pressure, but it won't make the meat mushy. Perform a quick release and serve with cauliflower rice, regular rice (not paleo or Whole30 compliant), or zucchini noodles. Optional: top with sliced green onion and sesame seeds, and hot sauce. Heat 1 tsp of coconut or avocado oil over medium-high heat in a large skillet or wok. Add half of the beef and cook for about 2 minutes. Transfer to a plate. Heat another 1 tsp of oil and cook the rest of the beef. Transfer to a plate. Add the pineapple sauce to the skillet and increase the heat to high. Cook for 2 minutes, stirring often. Add in the arrowroot mixture and stir to combine. Cook for another 3 minutes or until the sauce has thickened. Add the beef to the sauce and toss to combine. Serve with cauliflower rice, regular rice (not paleo or Whole30 compliant), or zucchini noodles. Optional: top with sliced green onion and sesame seeds, and hot sauce.